OFM Armless Plastic Classroom or Lab Chair  Free Shipping! 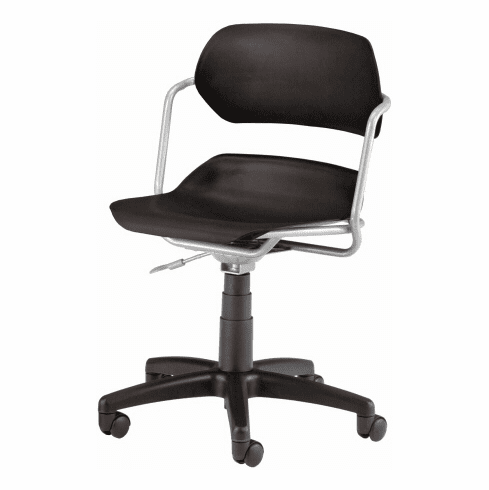 This armless task chair from OFM is ideal in tight work areas or industrial environments. The plastic seat shell is extremely durable yet lightweight and the heavy duty tubular steel frame is coated with your choice of black or silver finish. Other features include gas lift height adjustment, 360-degree swivel and a sturdy five star nylon base with dual wheel hooded casters. This chair meets or exceeds ANSI/BIFMA safety standards. Dimensions: Seat Size: 18"W x 19"D. Back Size: 18.5"W x 8.5"H. Seat height adjustment: 16"-19.5"H. Limited lifetime warranty from OFM. This chair normally ships within 1-2 business days from our NC warehouse.